Time for an update about my activities since returning to Ireland back in April. I haven't been posting here, but some of you may have seen my photos on the Hiace Hobo Facebook page.. When I first got back here I was able to celebrate some family occasions, a new nephew had just arrived, as well as my mum reaching a 'milestone' birthday. It was wonderful to be able to see them all regularly again, and of course, introduce my dog Rio into the fold. Then it was time to get reacquainted with some friends and do some serious catching up - in fact there are still quite a few people I haven't yet seen since returning. Next it was time to find a job, and get my bank account out of 'intensive care'. My top priority on job searching was to find something that would not affect my relationship with my dog Rio, and of course not involve a rapid descent back into the rat race again! I was fortunate enough to quickly find work for a well known charitable organisation, as a part-time delivery truck driver. I now spend a few days a week out on the open roads in N Ireland, with Rio as co-pilot up in the cab - his home from home. Its a good mix of cruising along the highways and byways, as well as great exercise loading and unloading the vehicle at the outlets. I have the remainder of the week to pursue work from my mobile office, parked up wherever I like. Yes - it was a busy day at work! I've also had plenty of time to make some important improvements to the van. I've increased my solar array to produce 220w of power, and also added a second 110ah leisure battery. This allows me to RUN THE FRIDGE! from electric, through an inverter on days with sunshine, and I have enough power to do everything else as well. This also allowed me to add a flatscreen pc monitor in the back, through which I can mirror my laptop screen, or watch TV if the mood takes me. I've also made a few other improvements that I'll cover in a future post. 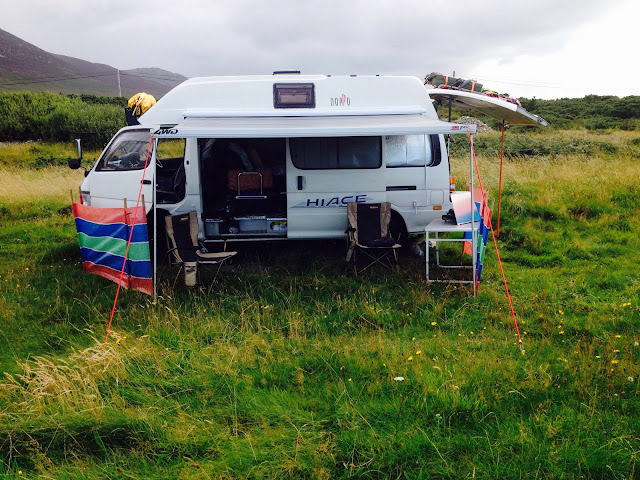 Rio and I have been hooking up with another Hiace 4WD pilot, Rob, to spend a number of weeks exploring Donegal in the North West of Ireland. Its from these trips that I shared the photos on FB. Donegal is a rugged place with mountains, wild atlantic coast, and is steeped in celtic atmosphere. In many areas, people work the land, still dig and burn peat, and speak Gaelic (in An Gaeltacht areas); folk music abounds also. As far as wild camping, there are many places of total freedom, and some gems can be found, especially for us 4x4 lads. In recent years a coastal route has been designated the 'Wild Atlantic Way' but to really get to the good spots one has to deviate from this, along country lanes, and even onto and along beaches themselves. The weather in Ireland hasn't been as good as we may have wished for over recent months, but its lead to the development of utilising our camper awnings for sitting under in the evenings, as the rain drums on taught canvas. A comfortable camp chair is a must - another addition, and cooking out of doors, then sitting around the fire chatting, listening to trad over a beer or two, has become the way of it, as Rio enjoys the freedom of endless dunes. Set your awning on a tilt to allow the rain to run off, and a 5 litre bottle hung on the corner with a carabiner keeps the need to search out a tap unnecessary. In addition to being able to find remote spots in the North West, another big benefit to being on the road in Ireland is the low cost of diesel compared to the UK. Life's been pretty kind to me of late, and despite the poor summer, we've still been really enjoying the outdoor life - and it hasn't been cold. Yet again, I find myself looking forward from a peaceful present, wondering where life will take me. No set plans at all at the minute - but the possibilities are very exciting. What will the next few months bring?